Today, multitudes of Pharisees are trying to stop praise (or even any mention) of God. As a result, as stated in the Gospel – the stones have to cry out. This is a church-approved Marian apparition. It involves a Sy rian mystic named Myrna Nazzour. The video has an Imprimatur. The messages (1982-1987) have a Nihil Obstat. Myrna experiences visions of both the Blessed Virgin Mary and Jesus. In many of her ecstasies she’s experienced the stigmata, caught on film. She has suffered Christ’s wounds in her hands, feet and side, and the crown of thorns. She’s felt the scourging of Our Lord. Her skin exudes 100% pure Olive Oil with healing properties. It has secreted from her face, hands, ears, feet, neck, stomach and eyes during her ecstasies. This phenomena is unexplainable to scientists and psychologists. The Icon of Soufanieh also exudes the same oil, which has healed and blessed a vast multitude. 2. The pilgrim statue of Our Lady of Fatima weeps. International pilgrim statue of the virgin of Fatima (America Needs Fatima)photographed in New Orleans LA in 1972, miraculously weeping real human tears. 3. Our Lady Of Rockingam Perth W.A. 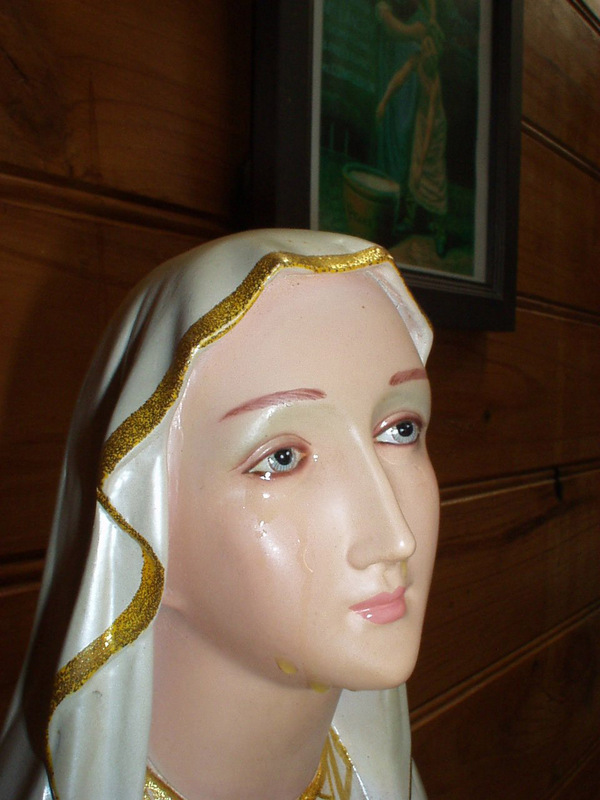 A fibreglass statue of Our Lady of Lourdes has been weeping oily tears since early 2002 in Perth. The position of the Catholic Church on the phenomenon is neutral, although Archbishop Barry Hickey has been to visit the statue in the lady’s home, and has called the event truly remarkable. He says, “The weeping seems to have had a profound effect on people who have witnessed it”. On March 19, the feast of St Joseph, Patty noticed that a statue she had in her home, had some type of liquid substance coming out of the eyes, as though it was crying. It had stopped the next day, but they returned on Good Friday and wept over the Easter triduum. It wept again on the feast of Corpus Christi. Then on August 14, Patty came home from work, and saw the statue not only weeping, but also her whole lounge room smelling of roses. She then realized this was no ordinary favour, and Fr Walsh (her parish priest) agreed. The local current affairs show, Today Tonight, even took an interest, and arranged to have scientific testing of the statue to see if it was fake, with Patty’s permission. The tears were analyzed and found to be of olive oil, with a rose scent.The scientist revealed that when he placed the statue flat on its back … and cleared the tears away, some came out of the eyes under his very gaze, against all the forces of gravity. Some people who have prayed in front of the statue and have applied the tears to cotton buds, claim miraculous cures, including one gentleman with terminal cancer. Other have returned to the practice of the Sacraments, and have broken down at the sight of the Virgin Mother of God weeping. On September 10th 2002, the Channel 7 current affairs program “Today Tonight” had the oil and the statue examined at Murdoch and Curtin Universities in Perth. The findings were released on a program airing on 12th September, 2002. The scientists could not come up with any obvious reason or explanation for the phenomena. On January 4, 1975, to the amazement of the religious community at Akita-Shi, Japan and Fr. Yasuda, the statue of the Virgin began to weep and did so three times that day. Also witnessing these tears, in addition to the sisters, were Bishop Ito and a number of people who had joined the nuns for a New Year’s retreat. In the 10 years following, scientific studies excluded any explanation other than the supernatural. The tears collected on the inside edge of the eyes flowed down the cheeks, collected at the edge of the garment near the throat, rolled down the folds of the garment and fell upon the globe under Our Lady’s feet. 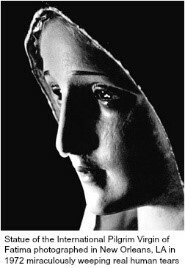 The statue wept for the last time on 15th September, Feast of Our Lady of Sorrows. Sr. Agnes was totally and incurably deaf when she entered the community, having lost her hearing on March 16, 1973. Sister was able to speak, and understood spoken messages by lip reading. As predicted by her guardian Angel, she temporarily regained her hearing on October 13, 1974. Deafness returned on March 7, 1975. Her hearing was permanently restored on May 30, 1982, as predicted by Our Lady during the first message of July 6, 1973. Both healings occurred instantaneously during Benediction of the Blessed Sacrament. Sr. Agnes is today in sound health, except for the rheumatism that has affected her hands. In Syracuse, Italy in 1953, an Italian woman, Antonina Janusso, was cured from pains while witnessing a weeping plaque of the Madonna in the home of the parents of her husband, Angelo. The tears purportedly were the source of many miracles throughout Italy. In a 1954 radio message Venerable Pius XII approved of the miraculous weeping after the tears were found by four different doctors to be human. On the 29th, 30th, 31st August and 1st September 1953, a chalk picture, depicting the Immaculate Heart of Mary, placed at the bedside of a young married couple, shed human tears. The phenomenon occurred, for shorter or longer intervals, both inside and outside of the house. There were many people who saw with their own eyes, touched with his own hands, they gathered and tasted the salt of those tears. On September 1, a commission of doctors and analysts, on behalf of the the Archbishop of Syracuse, after removing the liquid that flowed from the eyes of the little picture, subjected it to microscopic analysis. The response of science was: “human tears.” After the scientific investigation, there were no more tears. On October 17, 1954, a Radio Message of Ven. Pope Pius XII at the Marian Convention of Sicily, declared it believable. “It is not without lively commotion that we are aware of the unanimous declaration of the Episcopate of Sicily upon the reality of this event. Without a doubt Mary is in heaven eternally happy and suffers neither pain or sorrow; but she cannot remain insensitive, rather she always nourishes love and pity for the poor human race, which was given to her as their Mother, when sorrowful and tearful she remained at the foot of the Cross, where her Son was affixed. Will humanity understand the mysterious language of those tears? Oh the tears of Mary! Upon Golgotha they were tears of compassion for her Jesus and of sadness for the sins of the world. Does she cry again for the renewed wounds produced in the Mystical Body of Jesus? Or does she cry for so many sons, in which error and sin have extinguished the life of grace, and who gravely offend the Divine Majesty? Or are they tears awaiting the belated return of her other sons, once faithful, and now dragged down by the false mirage of the legions of the enemies of God?” (A.A.S. 46 (1954) 658-6615. In 1980, Julia Kim, who was suffering from terminal cancer, was miraculously healed. She was at that time a Protestant but eventually converted to Catholicism. In 1982, Julia saw a vision of Jesus with his Sacred Heart bleeding and asked for suffering for the conversion of sinners. For a total of 700 days between June 30, 1985 and January 14, 1992. Samples of the bloody tears were tested in a medical laboratory and were found to be human blood. There was Fragrant Oil from Our Lady’s Statue for 700 consecutive days from November 24, 1992, to October 23, 1994. The External Appearance of Bread in the Holy Eucharist changed into Visible Flesh and Blood on Julia’s tongue12 times between May 1988 and October 1996. The miracle on October 31, 1995, was witnessed by Pope John Paul II during a Mass in the Pope’s private chapel in the Vatican. Bishop Roman Danylak from Toronto, Canada, and Bishop Dominic Su of Sibu, Malaysia, also witnessed the miracles in Naju and Sibu, respectively, and wrote their testimonies expressing their belief in the authenticity of these miracles. The Sacred Host descended from above to the Chapel in Naju 7times between November 24, 1994, and August 27, 1997. The first two miracles were witnessed by the Apostolic Pro-Nuncio in Korea during his visit to Naju. On July 1, 1995, seven Sacred Hosts descended. They were consumed by two priests and five lay people including Julia according to the local Archbishop’s instructio The external appearance of the Sacred Host that Julia received changed into visible Flesh and Blood on her tongue. A sample of this Blood was tested in the medical laboratory at Seoul National University and was found to be human blood. The descent of the Eucharist on June 12, 1997, was witnessed by Bishop Paul Kim of the Cheju Diocese in Korea. The Eucharist again descended on August 27, 1997, during Fr. Raymond Spies’ visit to Naju. An intense fragrance continuied (May 1998) from the spot on the floor in the Chapel where the Eucharist landed. Numerous people have regained love and peace in their families and returned to the Sacraments. Many were healed physically, especially while repenting their sinful lives after experiencing Our Lady’s love. Julia’s Stigmata:Bleeding occurred on Julia’s two hands and two feet during her sufferings. Doctors examined Julia and stated that her wounds and bleeding had no medical explanation. Mike Willesee is a renowned Ausralian journalist who made a documentary “And the Stones will Cry Out” of the happenings described below. He went with his friend Ron Tesoriero to Bolivia to document this phenomenon when he heard about it. He was converted back to his faith as a result. Some of the details are described below. A statue of Christ bought by Ms. Silvia Arevalo, weeps and bleeds in Cochabamba, Bolivia. In the same city Katya (Catalina) Rivas experiences the wounds of the crucifixion of Christ, the stigmata. This Christ statue shed tears of human blood during Holy Week of 1995, the miraculous occurrence took place repeatedly during the recital of the Rosary. It was bought by Silvia Arevalo and started weeping in her home. First tears then sorrowful tears of blood. It was foretold by Saint Don Bosco that Jesus would leave a sign that he had been in Cochabamba, Bolivia. The statue has been thoroughly tested and found not to be fraudulent. The statue forms tears of human blood at the eyes that weep down the face, caught on camera . The blood has been tested and found to be human. The blood contained a piece of thorn, identified as a thorn from the Hawthorne bush, believed to have been the type of thorn used to make the crown of thorns for Jesus of Nazareth. Strangely missing a genetic profile. Could not get a genetic code. He stated that he could not explain it. A process of healing was occurring. Monsignor (Bishop Emeritus) Girolamo Grillo has written a book entitled “La Madonnina de Civitavecchia. The true story of a painful drama of love.” It is the story of a plaster statue from Medjugorje that cried tears of blood 14 times. (as reported on 17 May, 2011 in Romereports.com). He said that the pope’s personal secretary, Stanislaw Dziwisz, asked him, in June 1995, to take the statue to the Vatican. This was 3 months after the Bishop himself, had seen the statue weep. As evidence of this meeting, the book shows a letter describing the visit between the two. It’s signed and dated by John Paul II himself. “But Pope John Paul II also said, that one day, I should tell the world that John Paul II had revered the image of the Virgin of Civitavecchia, a statue from Medjugorje. I asked when I should make this public. He told me, I would know when. The Vatican however, in particular the Congregation for the Doctrine of the Faith, has not made any official statement to validate these accounts. (from the editors/managers of site) The last story was not news to us.